Fall small, but advertise big! 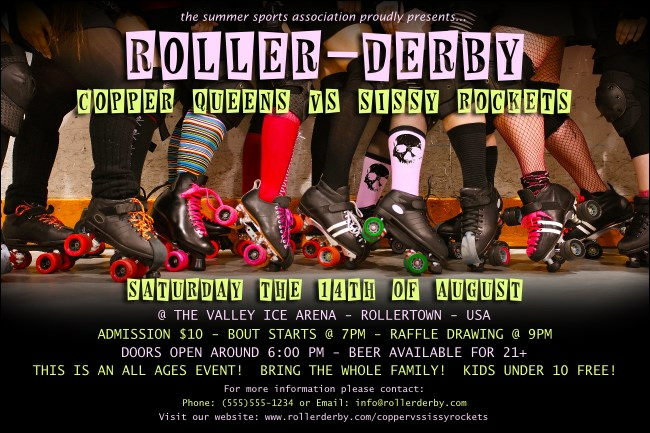 Roller Derby Legs Posters feature the powerful legs of a pack of dames who could skate you under the table. Picture all the details of your next bout laid out lovingly among the fishnets, skulls and knee-pads on eleven lines of pretty pink and yellowy-lime text. Fill out the template below and we'll send them your way! Rock ‘em and sock ‘em with Posters from TicketPrinting.com.